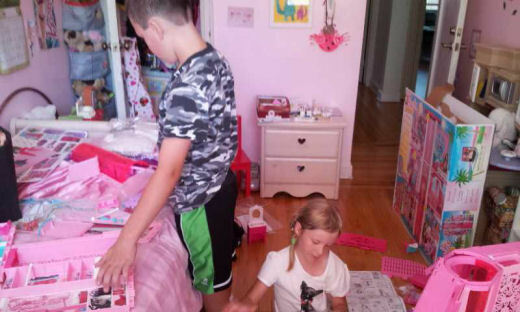 The Barbie Dream House arrived on Friday afternoon but I didn’t want to give it to my daughter that evening since she would have never wanted to go to sleep. 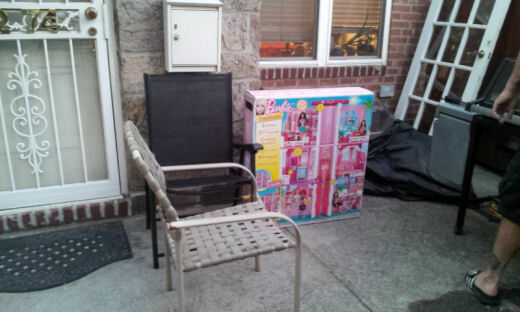 I was out that night and my husband texted me saying that he could not bring the Barbie Dream House inside without our daughter seeing it so he left it outside in the porch just like UPS man left it. So the next day after my son and her came back from the park we surprised her with the house. It wasn’t built yet but she could see from the detailed photograph on the box what it was. My husband helped her take all of the parts out of the box and the instructions. 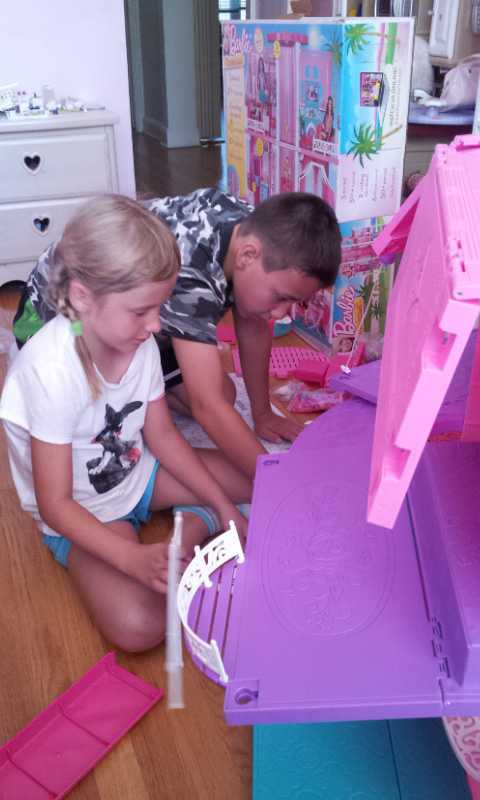 My 11 year old son came into the room and very nicely offered to assist my daughter in putting it together. Shortly after they kicked my husband out of the room and told him that they would handle it. I figured he would be a bit upset since he likes to help out our kids but he had an interesting smirk on his face when he left the room. 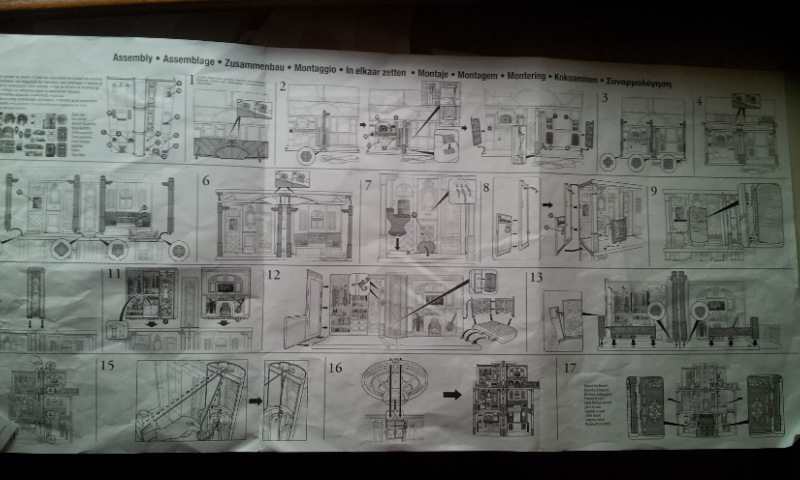 I would later find out that he had taken a look at the instructions, saw how complicated they were and figured they would be asking for his help sooner rather than later. Well my husband was right. 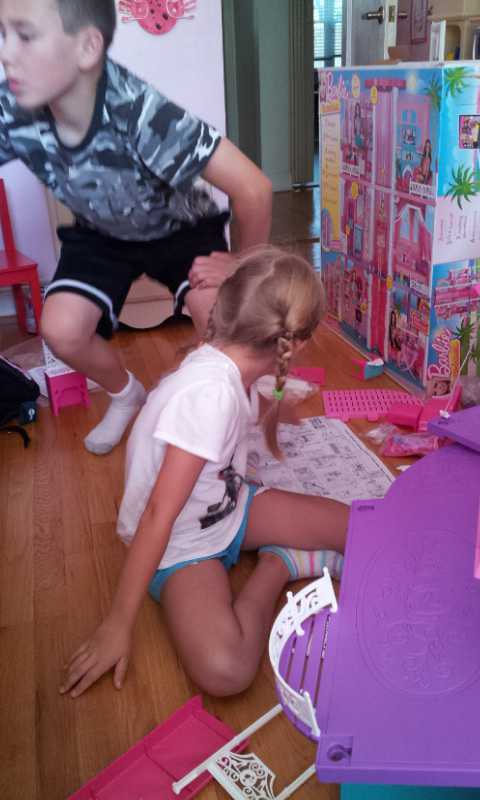 After about 30-40 minutes of my kids trying to put the Barbie Dream House together they called in my husband for help. When he got into our daughters room some of the pieces had been put together and many of the decals were put on the house. My husband looked at step one on the instructions and was a bit baffled. There were no written instructions just small-pictured diagrams with arrows pointing to various parts explaining what to do. I kept hearing him say that the instructions made no sense. There was some definite frustration in his voice and I could tell he was getting upset. I overheard him saying something about how instruction guides are not what they used to be. After a while I ignored his complaining and figured he was just posturing and would get over it soon enough. After 2 hours or so I came to my daughters room to get a progress report. 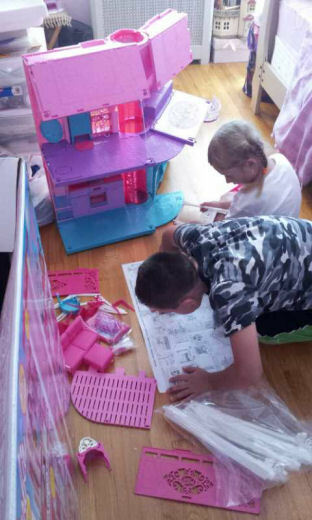 I could see that the house was just about done and my husband was applying the remaining decals while my daughter was putting together Barbie’s bed and placing all of the furniture in the Barbie Dream House. As I could see everything was coming together nicely. The only thing remaining that my husband couldn’t seem to fix was the elevator. He was convinced that there was something wrong with the plastic slots that the elevator went up and down on. And after he showed me what was going on I agreed it was some kind of defect or misalignment with the plastic. This wasn’t a part that he had put together but a part that came pre-assembled. After a bit of time he did get the elevator to go up a bit but it still didn’t work properly. 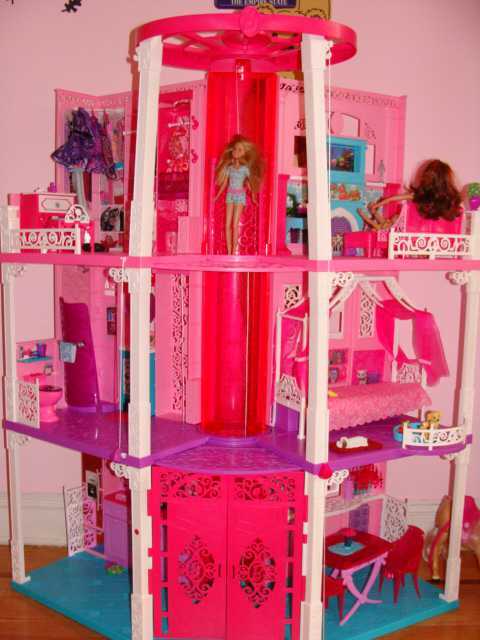 The next day my daughter played with the Barbie Dream House for the entire day. She was so happy with all of the space it offered and places for her Barbie clothes. What she really found neat was all of the sounds that the house made. For example there was a really cool sounding doorbell, a button for the blender in the kitchen, and even a button on the toilet that made a flushing sound. My Son and husband really got a kick out of that one. BTW what is about boys and bathroom humor anyway? 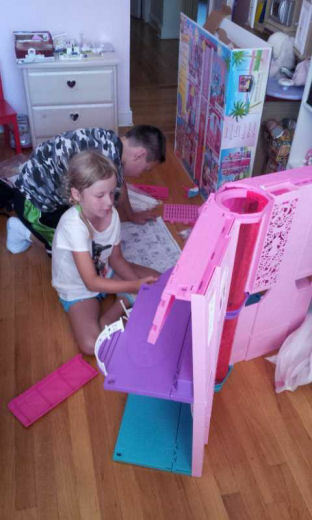 Overall my daughter really enjoyed and continues to enjoy her Barbie Dream House. She told my husband and I that she had been waiting for this house for like forever. Well for at least 2 years or so I would imagine. But in a little girls life that could seem like “Forever”. – a first for the fashion icon. i wish baby girl would keep her room cleaned. 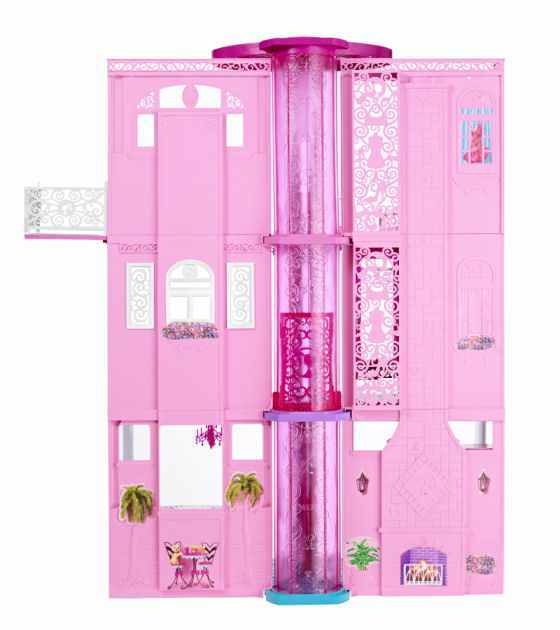 she wants that barbie dreamhouse 2013 for Christmas. 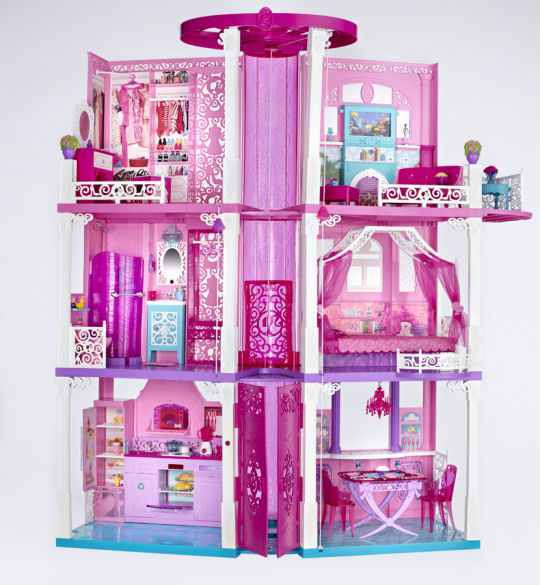 i wish babygirl could get the barbiedreamhouse 2013 one but i don’t know if they still sell it.